Just picked up 8 slots out of a Nebraska estate horde. Guy died 30 years ago. House had been closed up since his death. Machines are dirty but mostly in great shape... with a few exceptions. all were full of coins! 1) early war eagle. 5 ent. 10 stop mechanism. never had a pump for the handle. there are no holes in the base where one would have been. old repaint. Has side vendor cover. serial # 2242xx. 2) high top bonus. Bonus unit intact, but not functioning. needs a bonnet and back door. Runs fine except for bonus unit. 3) jennings club chief. (chinese front) light up. Filthy. needs a bath. top sign says "club chief". In the cash box was the inner case label which is stamped "Super De Luxe Chief". Also in the cash box was an original wiring diagram for the lights in the front casting. 4) black cherry. Very Clean! 5 cent. Still has the lock in the cash box door. still has both mechanism hold down screws. 5) Mills FOK. 5 cent. Decent shape. nice wood grain back door. Future pay indicator intact and working. Original / old mints intact. 6) jennings bronze chief. 25 cents. good shape, but chrome is pitted. Between the cash box, escalator, and coin tube, Plus the old nickel I found in the bottom of the case, I took $219.55 out this machine! cash box was full! 7) Mills castle front. 5 cent. Very nice older restoration. Very clean. Just needs 30 years of dust wiped off. Early golden nugget conversion. some original parts. some not. Castings and bonnet are original. Has ancient slots plaque on side. Not my cup of tea, but at least it's a conversion rather than a total fake. It was a buy all or none deal. One would assume some of these would be for sale soon ?? nice to buy a collection of machines like this. I seem to pick them up in "threes" at times. more photos later of the very early war eagle might be nice. Wow...Great find!!! Unless my eyes are deceiving me did you also purchase the Mills Lion Front, Watling (on the shelf), and the Mills on the floor?? rtmccurdy wrote: Wow...Great find!!! Unless my eyes are deceiving me did you also purchase the Mills Lion Front, Watling (on the shelf), and the Mills on the floor?? Those are other machines I will get to eventually. There are more than what is shown. JHSS-1944 wrote: One would assume some of these would be for sale soon ?? Some will be for sale in the future. We sell a lot of machines through our antique mall. 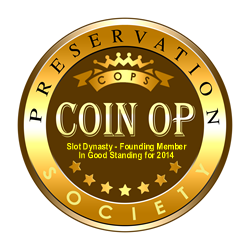 We are considering a slot / gameroom store in the near future, depending on how the law change effort goes in Tennessee. Im not too far from you. Do you sell at the mall in south Beloit then? Wow! See how easily things work out when Forum members put their location on the site. on pages 1,2,3, etc. Then click on any of the last pages, and see the big difference. but seems to have locked-up, and not continued on to page 31 as yet. Anyhow, glad to see that things may work out with the machines in this thread. Good Luck. SLOT DYNASTY wrote: Wow! See how easily things work out when Forum members put their location on the site. Not quite sure what you don't see as quite right with the membership page. When I go to it, things look right to me. Can you be more specific on what you are seeing as not quite right or include a screen shot? To start off with: The Forum member pages appear to have 50 names per page, although I have not checked every page. the reason I brought the subject up. #4674. It is (Regecon), that registered on Feb. 19, 2017, which is most likely the last name at this point, but is not listed. only way I can say it at this time. I am also sure, that there are about another 4 to 6 names not showing. briank wrote: Im not too far from you. Do you sell at the mall in south Beloit then? Yes. We usually have 6 to 10 machines in the mall at any given time.